Time for a quick Upper Valley update before I start blogging about London joints again…. Every once in a while something happens that causes me to revisit a place, be it finding out that I missed (such as finding out that I had missed the best dish at the now-closed The Pines Cafe in Palmdale, CA, or finding out that a place has a new menu. This is actually my third writeup of Gusanoz (my second introduced you to their burger business, Revolutionary Burger), but a few weeks ago they made another menu change that I thought was worthy of checking out: they added breakfast. This normally isn’t that newsworthy to me, since most places adding breakfast just means they’ve added some waffles and egg dishes, but Gusanoz went and added something new to the Upper Valley: Mexican breakfasts. Real ones, not just a few omelets with hot peppers, or a quickly done Huevos Rancheros. 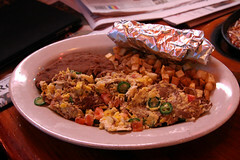 With my frequent trips to the Southwest, I’ve become a great fan of Mexican breakfast dishes, from the simple (such as my love of the burritos from Stan’s Grocery) to the elaborate, like Machaca con Huevos (simmered shredded beef scrambled with eggs, tomatoes, and peppers). So I was really excited that something like this was now available in the Upper Valley. So we went. I got the Machaca con Huevos. 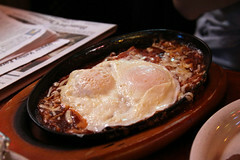 Carol opted for the Huevos Gusanoz: two cheese enchiladas with red sauce and eggs. I never though I’d see Machaca on an Upper Valley menu, and Gusanoz did it right. The beef was tender and flavorful, and nicely coupled with peppers, onions, and eggs in a scramble where no one ingredient dominated. The home fries were a little odd (they are obviously using the fry slicer, and then redicing the results, making for a very fine dice) but good. The tortillas were simply steamed permade tortillas (sadly, I think the Gusanoz experiment with homemade fresh tortillas ended), but still good. Carol was similarly satisfied with her breakfast enchiladas, enjoying the nice combination of eggs and red enchilada sauce. All in all, it was a good breakfast. For those of my readers in the Upper Valley that haven’t yet gone, go. You are missing out.